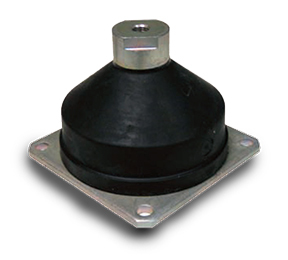 Rubber Design EPM shock mounts are specifically designed to provide excellent vibration isolation and protection against sudden and dramatic shock. EPM shock mounts are resilient equipment mounts that reduce the transmission of vibratory energy from equipment, such as pumps, motors, and compressors supporting structure. Due to the shape of the rubber element, these mounts can be specified with static deflections as high as 55mm for extremely low frequency isolation. 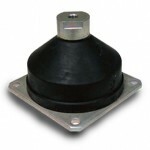 The high displacement form of these mounts also provides shock protection for sensitive electronic components or other equipment that is likely to be subject to damaging shock loads. For example, an RDS 165 - 128S has a maximum deflection of 55mm and are usually installed with static loads which deflect the mount in the range of 10mm. This allows the equipment to displace 45mm in the event of a shock event, significantly increasing shock time and reducing the force.